'Ruby Star' in 2015 with Oncidium. I've been more selective about which Amaryllis bulbs to keep, especially now since the bulb world seems to have opened up. There are now some really exotic-looking varieties bred for strong stems, an increase in floral substance, size and number. Once you've walked on the exotic side with Hippeastrum (the true botanic name for these tropical bulbous plants), there is no going back to the wishy-washy-by-comparison types. 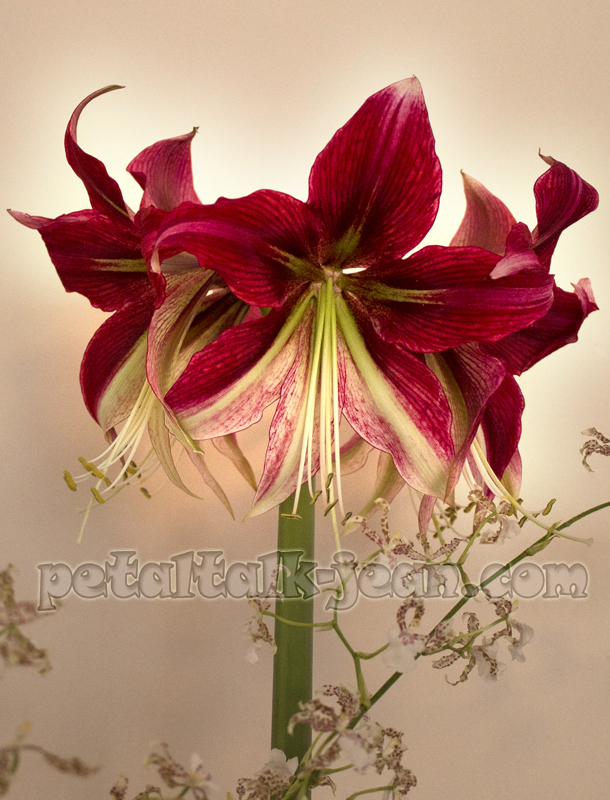 Hippeastrum 'Ruby Star' was introduced and patented by a company in Israel called Saad Assaf Flower Bulb Nurseries under the series name Mediterranean Amaryllis. I fell in love with its photo on the Easy to Grow Bulbs website in the fall of 2014 and knew I had to have it. 'Ruby Star' first bloomed in January, 2015. And it bloomed again in February, 2016! At this point in my Amaryllis-growing lifetime, 'Ruby Star' is probably my favorite so far. But there's another contender in the castle. Longfield Gardens sent me a bulb of Hippeastrum 'Double King' to try. It was the biggest Amaryllis bulb I've ever seen! I'm talking mushball size! I guess it had to be big to hold all of these luscious petals--two stems with four flowers on each stem and double the number of petals on each blossom! I never really liked some double flowers--it took me awhile to warm up to the tufted cone flowers, and I've yet to select a double lily. But 'Double King' is aptly named, because if you're going to go double, you'd better go king-sized. 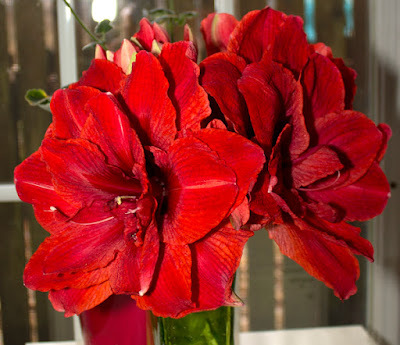 'Double King' in vase March 16. 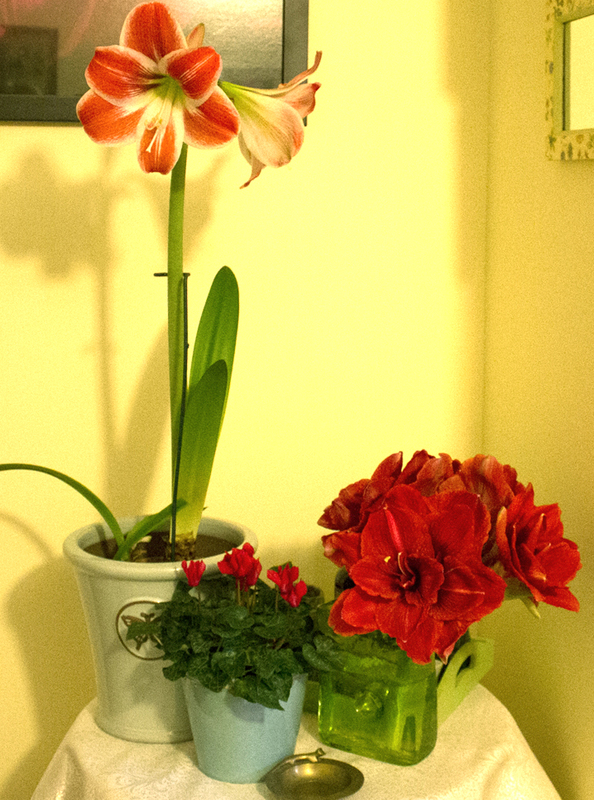 I've been having fun with this Amaryllis since it began its show more than two weeks ago. Its sturdy stem looked like it would have no trouble holding up the blooms, but when it began to lean, I propped it up by putting some Bananagram tiles in the cachepot, which worked for awhile. As the second stem began to open ten days later, I cut off the first one and put it in a vase. One by one, the flowers faded, and today, I have one flower left in a little vase, and all four still blooming in another vase. 'Double King' on right; 'Razzle Dazzle' on left. Another Hippeastrum that took me by surprise was the baby bulb of 'Razzle Dazzle' that has grown to blooming size since I first started growing this variety in the winter of 2012. 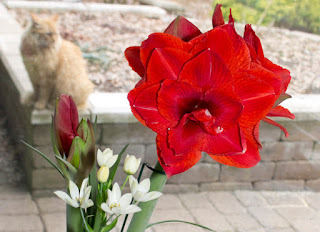 If you've read my first post on re-blooming amaryllis, you'll see I had a 'Razzle Dazzle' that bloomed earlier this year. So when one of the dozen pots of Hippeastrum formed a bud, I was guessing it would be 'Sweet Lilian' or 'Pavlova'. I was surprised indeed when the flowers popped open and revealed themselves as another 'Razzle Dazzle'! 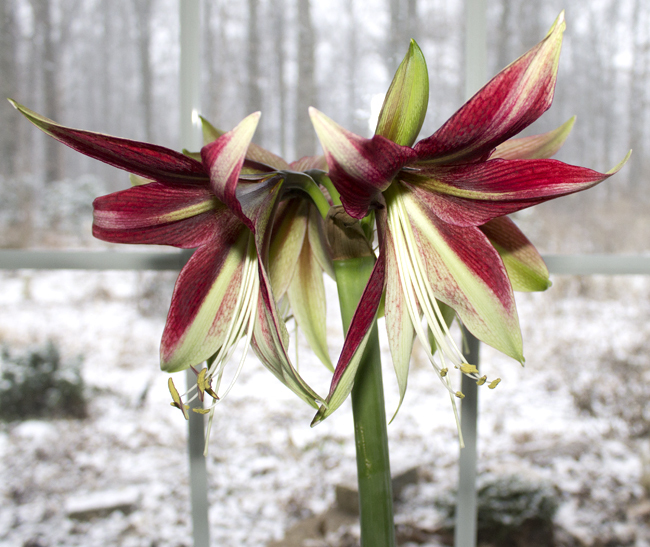 This is not to say I won't have any more Hippeastrum bloom this year. None of them currently are sporting buds, but that doesn't mean they won't. One of the drawbacks of growing these bulbs indoors is that they seem to bloom whenever they feel like it. Which, come to think of it, can also be an advantage. You Can Grow That! celebrates growing, and that includes surprises. Check out some of the other awesome things other bloggers are growing for tips and inspiration.